Over the years I had many people contacting me with the desire to build their own guitar. I have always enjoyed teaching trainees at my shop but I never had the capacity to provide individuals a guitar building course besides running our small production. 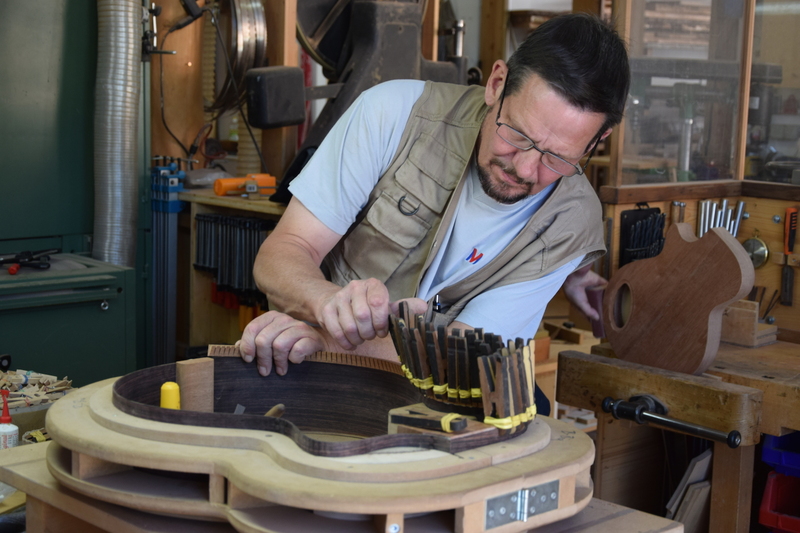 However, in 2016 I started offering “The Build it Yourself” option for small groups of 3-4 people where you get a chance to be part of the whole building process of your own custom guitar with all the professional support and tooling you need to build an outstanding high-end instrument. You will get a nice glimpse into all the different steps of the guitar building process plus you will learn much about different woods, constructions and different working techniques. My main intention with this course is to let you have a unforgettable experience by building your guitar with your own hands! The basic idea is, that you can order your custom guitar, but instead of me building it for you, you can come and build it all yourself! Once I got your application along with your guitar details I will prepare a kit for you so you can build your own guitar in 1-2 weeks, depending on electric or acoustic guitar. Within this time we bring the guitar to the stage where it’s ready for the spray booth. In an optional second or third week (again depending on electric or acoustic guitar) we will look into the lacquering process and end set-up of the instrument. Should 2 or 3 weeks be too much for you to spend a “working holiday” like that, you can also have me finish your guitar completely. It can then be shipped or picked up a few weeks later. 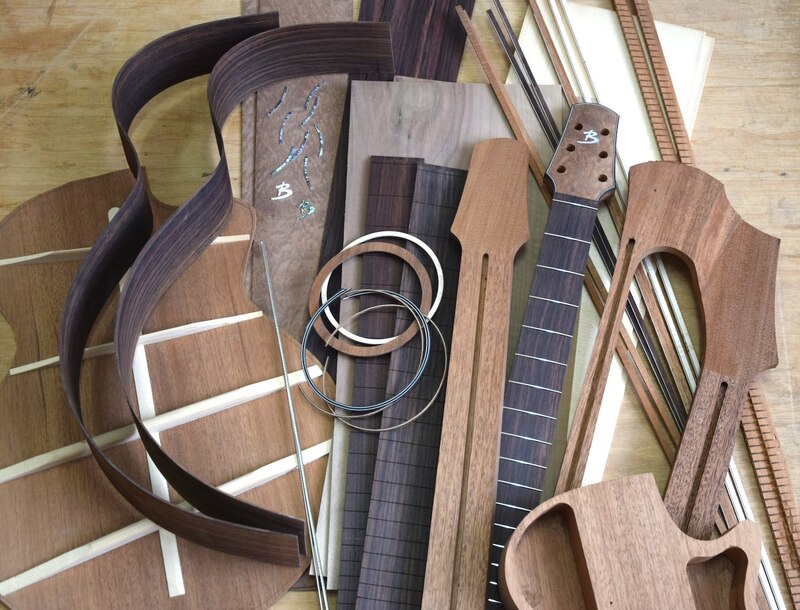 Basically the whole Brunner Guitar range of acoustic and electric guitars with and without removable necks are offered to “built it yourself”, except the harp guitars. During our time together we will have a main focus on teaching you as much as possible about guitar building skills, but I also hope this workshop experience will become a refreshing “time out” and break from your regular routine at home and will give you a chance to discover new sides about yourself and to make new friends. The beautiful Engadin valley and the nicely renovated accommodation with its cozy, rustic and roomy feel will provide an ideal relaxed setting and will make you feel like spending a nice holiday at the same time! We’re surrounded by beautiful mountains and historical villages and there’s lots to see and do throughout the valley between Scuol and St.Moritz area. There are many hiking and biking trails and you can also get up and down the valley by train easily (1min walk from our house). I also run a little seasonal “on request” bike shop during the summer months and I offer nice mountain bikes for rent. If you want to build a Martin, Fender or Gibson guitar copy we are definitely the wrong address, sorry! 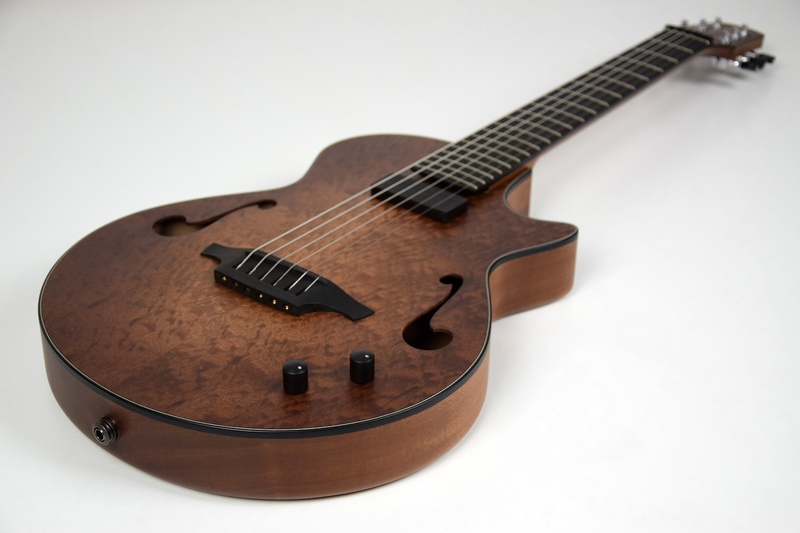 There are many courses and kits offered on the market for such guitars. The “Build it yourself” option will basically cost the same amount as if you would simply order the same Brunner Guitar (electric or acoustic) As a little bonus for “building it yourself” the accommodation is in that price included. Please be aware that if you want to do some fancy inlays, a high gloss finish or other more time consuming features you may have to plan on some extra days. 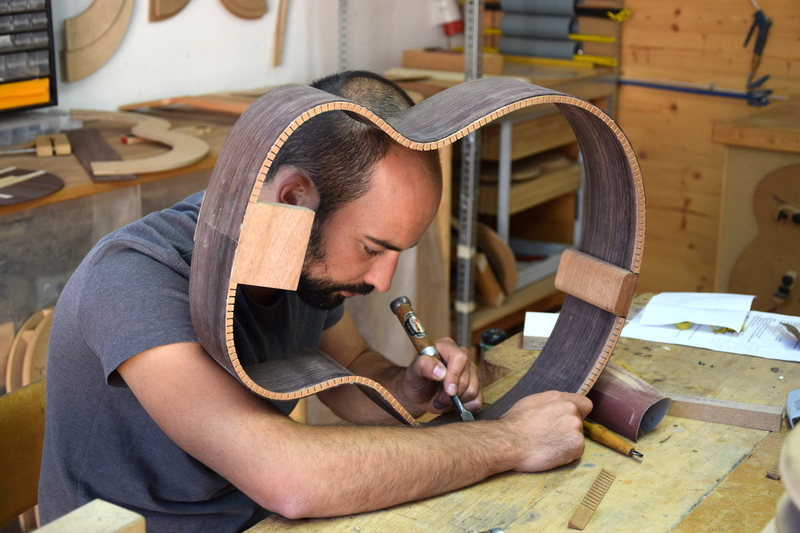 Depending on your time you can either choose to do the full course including lacquering and finishing or only up to the stage where the guitar is ready for lacquering. Since I have to prepare your “kit” in advance and may have to order some special material according to your order, I will send you the first invoice for a 1/3 deposit about 2 months before to the course starts. The remaining balance will be due just before we start. All attendees will be able to stay at our nice group accommodation on the top floor. There are three bed rooms with 3-5 beds in each room for when we rent it out to larger groups. During our time you will only be 3-4 people in total staying in those rooms. So you may have your own room or share it with one more person. There are two bathrooms with toilet and shower plus a washing machine. Besides the fully equipped kitchen there is a spacy living room and dining area with Wifi and TV. The huge outside deck is also nice to hang out and enjoy the beautiful scenery. All meals are at your own expense and each group will arrange themselves if they want to cook together or individually. There is a little grocery store about 1min from our house and we also have two hotels and restaurant in Lavin. You choose for how long you can or want to work on your instrument from 1-3 weeks during those time frames. In order to be able to get your materials ready and the kit prepared I will need your application at least two month prior to the course start. Ready to take on the adventure? If you hit the button below you get to choose the course date, all your details and materials for your dream guitar and you will see the total price at the bottom. Once you submitted the application form you will still be able to change some of your choices. If you’re not sure yet what you really want to build I’ll be happy to help you find the right choices. I want to build it myself!